The United States Mint on Wednesday will unveil pricing on some upcoming gold coins to include those commemorating the 100th anniversary of the National Park Service (NPS) and the two honoring former First Lady Betty Ford. 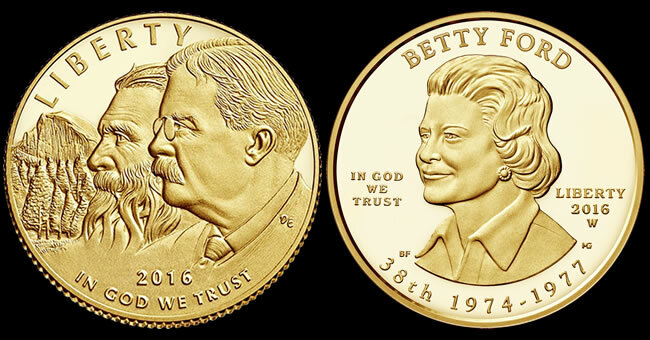 The NPS coins launch on Thursday and Betty Ford First Spouse Gold Coins go on sale Friday. There’s also a chance on Wednesday that the U.S. Mint will raise prices on earlier issued collector gold coins. Their prices are subject to change according to a pricing schedule and a weekly average of LBMA gold. Current prices are based on an average that’s within the range of $1,200.00 to $1,249.99 an ounce. Aside from Monday, gold has hovered above the level. If Wednesday’s LBMA gold price for the AM is above $1,213.80 an ounce and the PM fixing is over $1,249.99 an ounce, then prices of U.S. gold coins will climb by as much as $50 for every ounce of gold they contain. The following table summarizes the current and possible higher prices, and includes those for the upcoming National Park Service and Betty Ford gold coins. *NPS gold coins have a 30-day introductory sales period that includes a $5 discount. Those discounted prices are shown. Products with an asterisk (**) have been unavailable for some time. The U.S. Mint has adjusted pricing three times this year — all increases — with the last instance on Feb. 17. Past adjustments have tended to happen on Wednesdays at around 2:00 p.m. ET. This article will get updated with what actually happens. Update: Tumbling gold averted increases in coin prices. The precious metal’s weekly average was within the higher coin pricing tier but Wednesday’s LBMA gold price for the PM dived to $1,217.60 an ounce. The above gold coins are found on the U.S. Mint’s website page located here. CoinNews will write about the upcoming gold coins on their release day. Is anyone buying the NPS coin in gold ? Lousy designs on all of the Nat’l Park coins. I won’t be wasting my money on any of them. I agree. I’m not wasting my money on these. The premiums on the gold are too much for me. I’ll be getting the silver coins. Are they designs great no but I’ve seen a lot worse from the Mint. I’m passing myself. Don’t like the 90% gold either. Very interesting….No takers so far. I would love if mint made gold coins of US presidents, not golden. I love buying coins that others don’t want. Mintages tend to be lower and over time it usually pays off. The last one I bought was the general Macarthur. It graded MS 70 with a pretty low mintage. One day it will make me a nice profit. I would not be surprised if this coins final sales are lower than the Macarthur. All right now. Did any of you go back on your word and BUY IN (besides you Tommy2coins)? Personally I think it has the potential to be a good investment. I agree with you Tommy! I’m in! Won’t change my mind. The $1.00 coin looks like a rotting tree stump. Regardless of the possible low mintage, unless you really like the coin, I don’t think it will have a good resale value.